As well as clearing litter there are suggestions that lovers of the lane could also improve it by guerrilla gardening and encouraging nature, for example by building woodpiles for hedgehogs and erecting nesting boxes. Perhaps a Neighbourhood Watch group could be set up. I’m sure these ideas will be discussed on Sunday, along with proposals to put lockable gates at each end of the lane to stop fly tipping trucks from dumping their loads of rubbish. The gating suggestion was set out in a meeting at the Town Hall on the 19th September attended by Paul Stephen, the Community Safety Officer and Partnership Coordinator in Greenwich Council’s Safer Communities Team, Martin Ryan from CleanSweep, local councillor Danny Thorpe and a few local residents. There would need to be gates at the Plum Lane junction and just above Highview flats down near Dallin Road, and a “Friends of Mayplace Lane” group would need to be established to take responsibility for the lane after the gates had been installed. It was stated that because the lane is unadopted the council had no legal responsibility to clear fly-tipped rubbish, though they have been doing this up to now, and if gates were installed it was expected that the Friends would be responsible. Details of how the scheme would work, such as exactly what gates would be used and who would be given keys for the gates, were left for later clarification. Before gates can be put up the council will need to get a “gating order”, for which they have to follow a process which includes a full consultation of affected people. To decide whether it was worth starting on this process an informal door-to-door poll was conducted one Saturday morning at houses in Eglinton Hill and Brinklow Crescent which back on to Mayplace Lane. The result, according to an e-mail from Councillor Danny Thorpe, was: “We have 39 responses in total, with 37 in favour and two against or not interested.” This was enough for the council to start on the gating order process. I haven’t heard yet how it’s progressing. 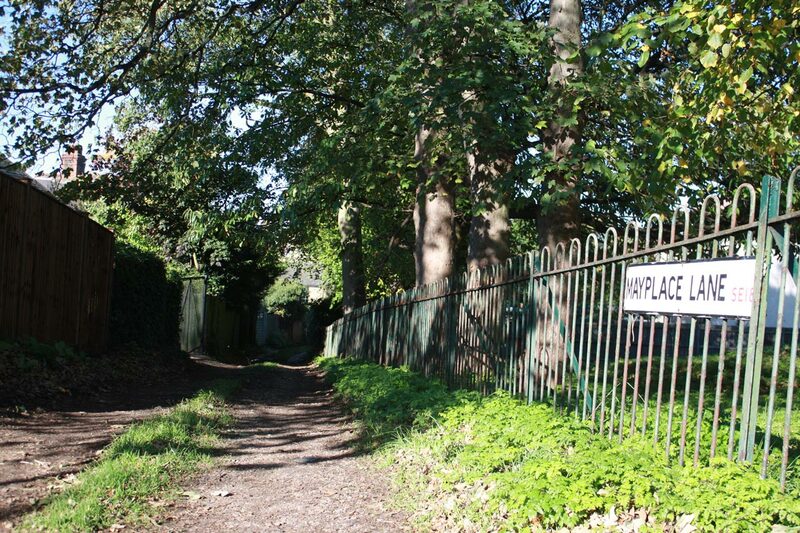 I think Mayplace Lane is fascinating, and love the idea that perhaps it was once a route that Bronze Age people used to visit the land of their ancestors – the barrow cemetery that once adorned the top of Shooters Hill. I had read that it was an old track that predated the modern road layout, and found confirmation serendipitously at the Firepower museum‘s recent community open day. 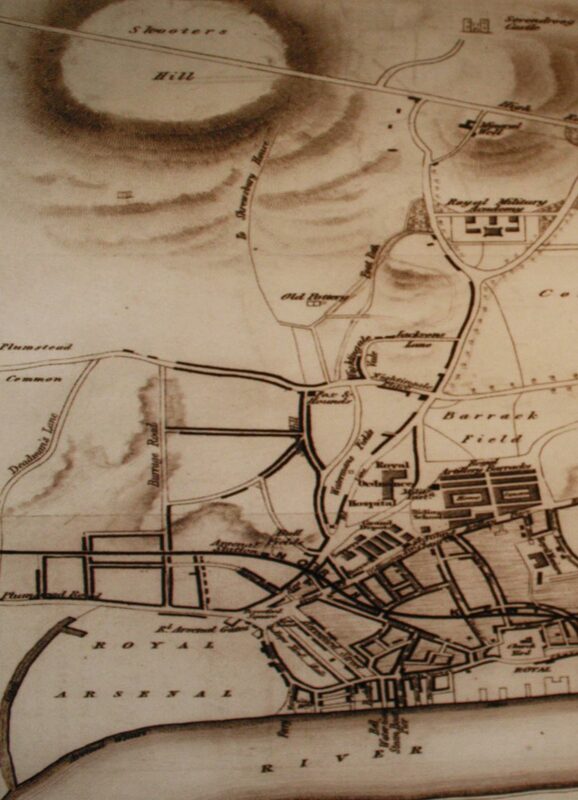 A map of Woolwich and environs from 1837 on the wall at Firepower includes an intriguing path from the top of Sandy Hill Road up to the summit of Shooters Hill. You can see it on the snippet above labelled “To Shewsbury House”. It starts just over the road from the Fox and Hounds; a pub of that name is still there today. Why do I think that path is Mayplace Lane? Well its northern end is in about the same place – continuing the line of Sandy Hill Road, roughly where Herbert Road is today. 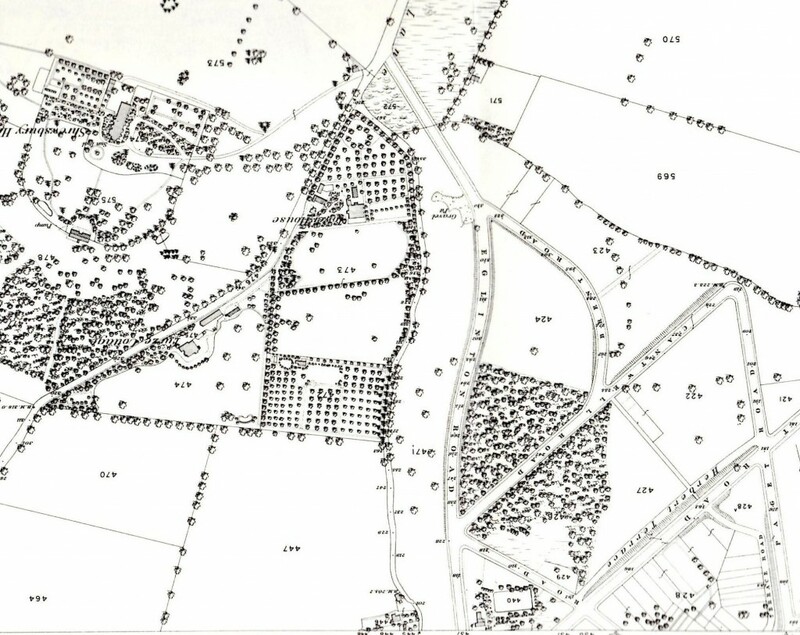 But also, in the 1866 OS map from Alan Godfrey shown in my earlier post about Mayplace Lane you can see that Mayplace Lane ends up close to the start of the old Shrewsbury House’s long drive way, which was roughly where the fire station is now. I’ve included the 1866 snippet again below, rotated through 180° so that South is at the top as in the 1837 map. Mayplace Lane winds up the centre of the map. Interesting that in the 29 years between the 1837 and 1866 maps some modern roads such as Eglinton Hill have been constructed – the start of the development of the Herbert Estate by British Land. 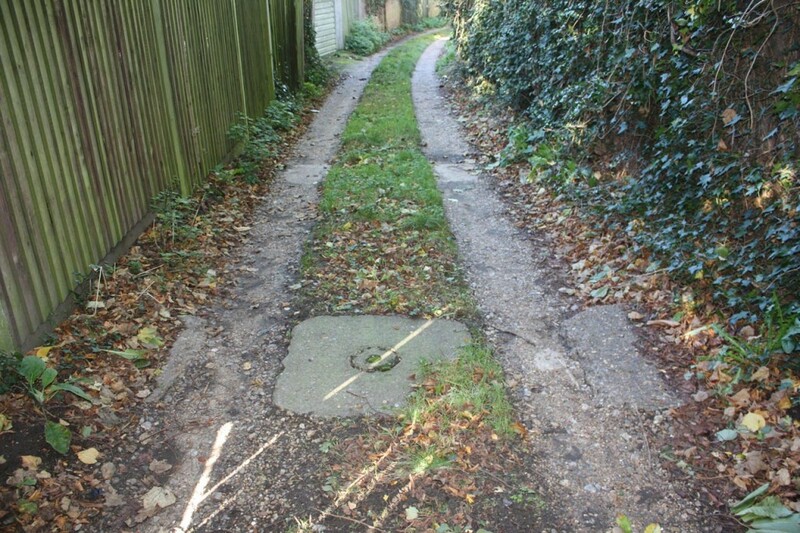 Another thing that’s been puzzling me about Mayplace Lane, possibly related to gates, is the strange concrete blocks in the ground just past the Bronze Age barrow. You can see them in the photograph below – two rows of three square concrete objects a couple of yards apart. Each piece of concrete has a distinct, separate circle at its centre, as though there was a concrete post which has been cut off level with the ground. Does anyone know what they are or were? There’s nothing on the old OS maps to indicate that there was a gate or barrier at this location, and they look more 20th century than 19th. I wonder if they could be something to do with second world war defence preparations. There were other defensive structures nearby – for example Dragon’s teeth were set up in Eglinton Hill and Brinklow Crescent to impede movements of tanks and mechanised infantry. I’d love to know – but it’ll have to be another topic for my next visit to the Greenwich Heritage Centre. Concrete Structures: bases of anti-tank ‘dragons teeth’ from early WW2 in case of German invasion. Thanks Richard, that’s interesting. I wonder if there are any photos of what they were like at the time.